Cocoa, from which chocolate is created, is said to have originated in the Amazon at least 4,000 years ago. Chocolate, derived from the seed of the cocoa tree, was used by the Maya Culture, as early as the Sixth Century AD. Maya called the cocoa tree cacahuaquchtl… "tree," and the word chocolate comes from the Maya word xocoatl which means bitter water. To the Mayas, cocoa pods symbolized life and fertility... nothing could be more important! Stones from their palaces and temples revealed many carved pictures of cocoa pods. The Aztecs attributed the creation of the cocoa plant to their god Quetzalcoatl who, descended from heaven on a beam of a morning star carrying a cocoa tree stolen from paradise. In both the Mayan and Aztec cultures cocoa was the basis for a thick, cold, unsweetened drink called xocoatl… believed to be a health elixir. Since sugar was unknown to the Aztecs, different spices were used to add flavor, even hot chili peppers and corn meal were used! Aztecs believed that wisdom and power came from eating the fruit of the cocoa tree, and also that it had nourishing, fortifying, and even aphrodisiac qualities. The Aztec emperor, Montezuma, drank thick chocolate dyed red. The drink was so prestigious that it was served in golden goblets that were thrown away after only one use. He liked it so much that he was purported to drink 50 goblets every day! King Ferdinand and Queen Isabella were presented with many strange and wonderful things… the few dark brown beans that looked like almonds didn’t get a lot of attention. On his fourth voyage to America, Columbus landed in what is now called Nicaragua. He was the first European to discover cocoa beans being used as currency, and to make a drink, as in the Aztec culture. Columbus, who was still searching for the route to India, still did not see the potential cocoa market that had fallen into his lap. Hernando de Oviedo y Valdez, who went to America in 1513 as a member of Pedrarias Avila's expedition, reports that he bought a slave for 100 cocoa beans. According to Hernando de Oviedo y Valdez, 10 cocoa beans bought the services of a prostitute, and 4 cocoa beans got you a rabbit for dinner. Hernan Cortez, who conquered part of Mexico in 1519, had a vision of converting these beans to golden doubloons. While he was fascinated with Aztec's bitter, spicy beverage [he didn’t like the cocoa drink], he was much intrigued by the beans’ value as currency. Later, Cortez established a cocoa plantation in the name of Spain… henceforth, "money" will be cultivated! It was the birth of what was to be a very profitable business. Chocolate affected many cultures and traditions, and even…international economics! Cortez postulated that if this bitter beverage were blended with sugar, it could become quite a delicacy. The Spaniards mixed the beans with sugar, vanilla, nutmeg, cloves, allspice, and cinnamon. The results were tantalizing, coveted, fashionable, and reserved or the Spanish nobility which created a demand for the fruits of his Spanish plantations. Chocolate was a secret that Spain managed to keep from the rest of the world for almost 100 years! Dominican friars bring a delegation of Mayans to meet Philip. Spanish monks, who had been consigned to process the cocoa beans, finally let the secret out. It did not take long before chocolate was acclaimed throughout Europe as a delicious, health-giving food. Pope Pius V, who did not like chocolate, declared that drinking chocolate on Friday did not break The Fast. After taking a Spanish ship loaded with cocoa beans, English Buccaneers set it on fire thinking the beans were sheep dung. The first shipment of beans intended for the market makes it to Spain. When the British captured a Spanish vessel loaded with cocoa beans, the cargo was destroyed as useless. The first book devoted entirely to chocolate, "Libro en el cual se trata del chocolate," came from Mexico. Ann of Austria, daughter of Philip II from Spain, introduced the beverage to her new husband, Louis the XIII, and his French court, too. 200 small cocoa beans were valued at 1 Spanish real, or 4 cents. When the Spanish Princess Maria Theresa was betrothed to Louis XIV of France, she gave her fiancé an engagement gift of chocolate, packaged in an elegantly ornate chest. The chocolate craze which now included candy took hold in Paris and then conquered the rest of France. London's first chocolate shop is opened by a Frenchman. London Chocolate Houses became the trendy meeting places where the elite London society savored their new luxury. The first chocolate house opened in London advertising "this excellent West India drink." As chocolate became exceptionally fashionable,The Church of Rome took a second look at this bewitching beverage. The judgment: "Liquidum non frangit jejunum," reiterated that a chocolate drink did not break the fast. But eating chocolate confections didn’t pass muster, until Easter. Is this where the Easter Bunny makes an entrance? Helmsman Pedro Bravo do los Camerinos decides that he has had enough of Christian voyages of exploration and settles in the Philippines, where he spends the rest of his life planting cocoa, thus laying the foundations for one of the great plantations of that time. Sometimes people just don’t see it…this time creativity prevailed! As the story goes, a bowlful of almonds is dropped, and the angry chef tries to "box the ears" of his kitchen boy… but instead he spills a pan full of hot, burnt sugar over the almonds. Meanwhile the renowned gourmet, Duke of Plesslis-Praslin, is waiting for his dessert! An Avant Guard, London Coffee House called At the Coffee Mill and Tobacco Roll, goes down in the annals of history for serving chocolate in cakes, and also in rolls… in the Spanish style. By Royal Decree, November 1, 1677, Brazil [later to achieve an important position in the world market] establishes its first cocoa plantations in the State of Par . Heinrich Escher, mayor of Zurich, drinks chocolate in Brussels and introduces the awe-inspiring concoction to his friends at home… nothing he has ever tasted is even slightly like this brew! Chocolate makes its appearance in Ger many, and Frederick I of Prussia reacts by imposing a tax. Anyone wishing to pay homage to its pleasures has to pay two thalers for a permit. Emperor Charles VI transfers his court from Madrid to Vienna and along with his Court, comes chocolate. Italian Chocolatiers from Florence and Venus, now well versed in the art of making chocolate, are welcomed to France, Germany and Switzerland. Especially the hawking of chocolate! In fact, Frederick prohibited chocolate in his realm. In where Chocolate flourished, It’s high price ensured that only the wealthy could indulge. Diligently forging their concept of Democracy, Americans take time out to discover chocolate. 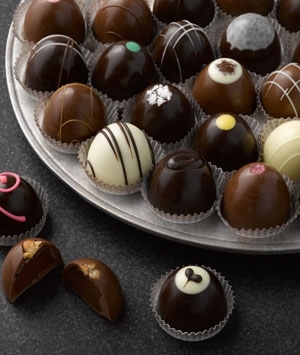 The production of chocolate proceeded at a faster pace than anywhere else in the world. It was in pre-Revolutionary New England. The first machine-made chocolate is produced in Barcelona. In Germany, the Josty brothers from Grisons open a confectioner's shop and make a hit selling Swiss Chocolate… and they open a chocolate factory in Berlin. AsJohann Wolfgang von Goethetours Switzerland, he insists on having Chocolate available at all times… and a chocolate pot. Antoine Brutus Menier built the first industrial manufacturing facility for chocolate. 1810, Venezuela's Dominates the Industry:. A survey shows that Venezuela produces half of the world's chocolate. And 1/3 is consumed by the Spaniards. : In a former mill near Vevey, Fran‡ois-Louis Cailler, who had learned the secrets of the chocolate trade in Italy founds his first factory. As cocoa plantations spread to the tropics in both hemispheres by the 19th century, the increased production lowered the price of the cocoa beans and chocolate became a popular and affordable beverage. Secret techniques in blending and roasting beans, traditional family recipes and creative interpretations, and innovative candy making techniques have been handed down from generation to generation. off the west coast of Africa on the Principe Island in the Gulf of Guinea, Ferreira Gomes [from Portugal] introduces the cocoa tree as an ornamental plant. The Press lead to reduced prices and helped to improve the quality of the beverage by squeezing out part of the cocoa butter. Drinking chocolate had a smooth consistency and a more pleasing taste. Solid eating chocolate was developed by J. S. Fry and Sons, a British chocolate maker. This smooth and velvety chocolate almost completely replaced the old coarse grained chocolate. The exhibition was at Bingley Hall at Birmingham, England. : Queen Victoria’s husband, Prince Albert orchestrated The Exposition in London. It was the first time citizens of the United States were introduced to bonbons, chocolate creams, hard candies (called "boiled sweets"), and caramels. Portuguese Baron of Agua Iz, takes the cultivation of cocoa from Principe Island to a neighboring island, Sao Thome, and then to the African continent. Members of the Basle Mission in Ghana encourage the growth of this emerging crop, and small to medium farmers turn Ghana into one of the most important producers. After eight years of experimentation, Daniel Peter from Switzerland puts the first milk chocolate on the market. 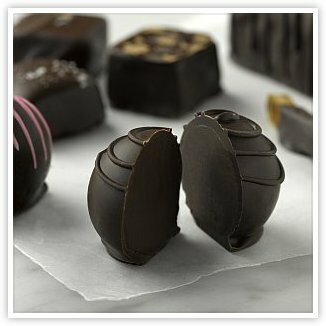 Rodolphe Lindt of Berne, Switzerland, invented "conching", a means of heating and rolling chocolate to refine it. After chocolate has been conched for 72 hours and has more cocoa butter added to it, chocolate becomes "fondant" and it melts in your mouth! Spain, where chocolate was first introduced to Europeans, falls far behind. Germany consumes the most per head, followed by the United States, France and Great Britain. Bolstered by an unbroken series of medals at international exhibitions, Swiss Chocolate, like bratwurst, rosti and fondue, is elevated to a national dish. 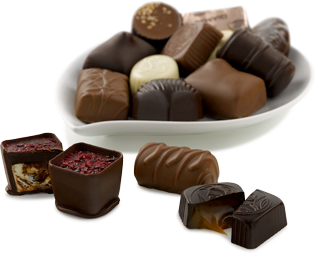 Jules Sechaud of Montreux of Switzerland introduced the process for filling chocolates. The Chocolate Manufacturers Association of the United States of America (CMA) was organized in. The New York Cocoa Exchange, located at the World Trade Center, was begun so that buyers and sellers could get together for transactions. The U.S. government recognized chocolate's role in the Allied Armed Forces. It allocated valuable shipping space for the importation of cocoa beans which would give many weary soldiers the strength to carry. Today, the U.S. Army D-rations include three 4-ounce chocolate bars. Chocolate has even been taken into space as part of the diet of U.S. astronauts. You may read that chocolate is an aphrodisiac based on studies from reputable universities. Scientists have isolated phenylethylamine (PEA) which is a stimulant found in chocolate, and also in the brain. A minuscule amount of PEA is released at moments of emotional euphoria, raising blood pressure and heart rate. There is no evidence that PEA found in foods increases PEA in the brain. And by the way, cheddar cheese, salami, and pickled herring all contain more PEA than Chocolate, so join our Gourmet Cheese of the Month Club too! Industrialization brought Chocolate to the masses, yet Chocolate is still considered to be an exceptional indulgence!